Download our Business Broker Guide and learn about becoming a Transworld Franchise Owner. If you excel at closing deals, you might be ready for your next challenge. We propose a way in which others can benefit from their own business ventures, based on your skills. But is business brokerage for you? Becoming a business broker requires more than simply selling a business from one owner to another. Identifying the right businesses, connecting with the right sellers and the right buyers requires an ability only a select few possess. The broker guide describes the five key characteristics Transworld Business Advisors has identified, which have proven to separate mediocrity from excellence. Do you have what it takes, to make it as a business broker? Download our the Business Broker Guide to find out if you do. There are business advisors. And then there are Transworld Business Advisors. The opportunity for deal-makers, within the business brokerage industry means you can create a business to suit your skills, based on the Transworld model. Avoid the hassle and delay of starting your own business, by using our systems and process to gain a head-start on the route to success. Transworld Business Advisors offers a low-cost franchise opportunity of just £30k franchise fee, plus £20k marketing investment +VAT. By choosing to run your business from anywhere you take control over ongoing premises and staff costs. Until you have established your business, and are ready to rise to the next level. Choose your own work-schedule and attain the lifestyle you dream of. With the flexibility of how you build a profitable Transworld Business Advisors franchise, based on the model developed over 4 decades, you can work around your lifestyle goals. Developed over almost 40 years’ experience of securing the right deals for the right people, you can gain exclusive access to the Transworld Business Advisors proven model for success. Offering high-earning potential, you call the shots to establish a better future for yourself. TAKE YOUR FUTURE TO THE NEXT LEVEL! 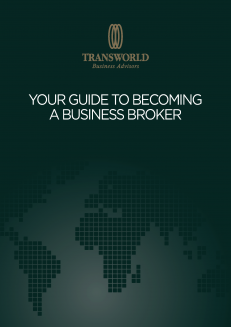 Download the Transworld Business Advisor guide to becoming a broker.